NEW YORK CITY (Thursday, January 23, 2014) – The National Thoroughbred Racing Association (NTRA) announced today that Sunshine Millions/Cal Cup XXIV, also known as Cal Cup, a day of five California-bred stakes at Santa Anita Park worth nearly $1 million in purses, and the Breeders’ Cup Betting Challenge will be official partners of this weekend’s Daily Racing Form/NTRA National Handicapping Championship (NHC) Presented by Racetrack Television Network, Sovereign Stable and Treasure Island Las Vegas. The newly revamped Cal Cup program is set for Saturday, which is Day 2 of the NHC finals at Treasure Island Las Vegas. As part of the agreement, two rich Cal Cup stakes will be among the mandatory races NHC finalists are required to play as part of the world’s most prestigious handicapping tournament. On each of the contest’s first two days, players must submit mythical $2 Win and Place wagers on eight mandatory races, as well as seven chosen from a menu of leading racetracks. Cal Cup will also receive increased visibility throughout the NHC finals, where hundreds of the continent’s top horseplayers will assemble to compete for at least $1.5 million in cash prizes and an Eclipse Award as Handicapper of the Year. The Cal Cup, co-sponsored by the California Thoroughbred Breeders Association (CTBA), will be run in January for the first time this year. A pair of $250,000 stakes highlight the card, which attracted competitive fields of 10 or more in each of the five Cal Cup races. View the Cal Cup entries via Equibase.com here: http://www.equibase.com/static/entry/SA012514USA-EQB.html. First post for Saturday’s Cal Cup is Noon Pacific/3 p.m. Eastern. The new Breeders’ Cup Betting Challenge (BCBC) partnership will award NHC players accumulating the highest point totals on Day 1 and Day 2, respectively, of the three-day contest with paid entry fees and live bankrolls totaling $10,000, plus airfare and hotel, to the high-stakes BCBC, to be held at Santa Anita Park in Arcadia, Calif., on October 31 and November 1, 2014. A $10,000 BCBC spot also will be awarded to the winner of a lucrative consolation tournament on Day 3 of the NHC. Now entering its sixth year, the BCBC has become one of the most sought after live-money tournaments in racing. A $10,000 buy-in is required to participate in the BCBC. Participants also receive first-class access to the two best days of racing in the world, the Breeders’ Cup World Championships. 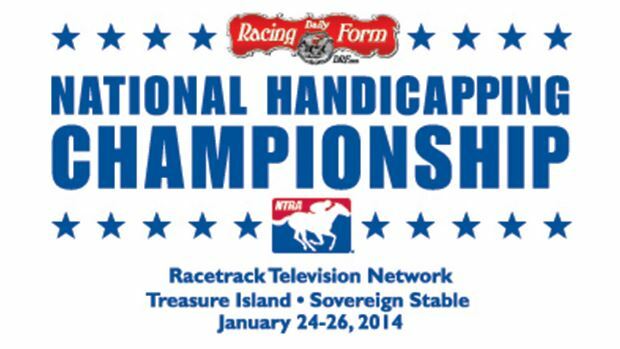 The top 15 finishers in BCBC Finals each earn a spot in the 2015 DRF/NTRA National Handicapping Championship.